My name is Mia, and true to my username, I'm getting my Master's degree in archival studies, focusing on video games and digital records. I am here and formally introducing myself because I have chosen to do a case study of MOULa as a final project for my degree, and to examine the incredible journey of Uru and its citizens as an example of how a massively multiplayer online game can survive and thrive as this one has. This topic is not often discussed in my profession, so I hope to show how Cyan and the fan community responded to Uru's closures and how MOULa can be an example for other MMOs in terms of preservation strategies. I definitely want to stress that MOULa isn't going anywhere! In fact, part of my argument about the preservation of MMOs is that it's necessary to keep them alive in some fashion, and my main focus is on how the fan community and the development team approached this challenge for MOULa. I will be consulting with Cyan to get their perspective on how Uru Live transformed into the MOULa of today, and in short order I may put out a call for interviewees here, if anyone wishes to contribute (I'm still in the process of designing my study so I'm not sure how many interviews I'll be doing yet). My project is being fully supervised, and will adhere to the Canadian Tri-Council Policy Statement on research ethics; so in the interest of full disclosure I'll say that I may have run into a few of you already during my travels in the game, but I have not gathered any information whatsoever about anyone's names, whereabouts, or activities. This post is intended to let everyone know why I am here, and none of my research will involve documenting anyone without their knowledge. I will not make any observations without informing people ahead of time so that informed consent can be provided, and, of course, consent can also be rescinded at any time. If you have any questions at all, please do not hesitate to message me, and I would be more than happy to answer them. Chogon is also aware of my presence and has offered to answer questions as well. Welcome Mia! I always like when research is done on my favorite topics, and I would gladly participate in your study. Are you aware of the research on Uru in similar directions done by Celia Pearce aka Artemesia and her students? Yes indeed I am! I loved Celia's book and Nicholas' thesis, and both have been a huge part of my literature review. Thanks for your enthusiasm! You'll have an interesting quest finding some of the players that have been around since the early days. They are in various games now. Some are building copies/tributes of Uru in Unreal, Guild Wars, Second Life, OpenSim, and in home-run servers. I have not seen any in Sansar, yet. Some of the old time players still visit this forum. Getting their attention may be a little tricky. Mia, unfortunately I did not participate in the first iteration. I tried to but the game canceled before I could get in. (thankyou Ubisoft) The second go I did not know about, Until URU, I arrived in cavern ,so to speak, when Game Tap produced it. If I can be of any assistance, It would be my pleasure. I can hardly believe this game has lasted close to 20 years, but so glad it has. Mia, I missed the opening of Uru Live (I had only a Macintosh at the time) but followed the story on some of the forums (Tapestry Shard, Uru Obsession) and entered Until Uru, the fan-run version, in May of 2005. My story isn't a big part of Uru's overally story. What may be of interest to you is how my participation in Uru affected what I did, and still do, elsewhere. If that's of interest to you, I'd be happy to contribute. I find the old Cavern Today podcasts an interesting visit to Uru past. They started in the Until Uru period and continued up to the start of MOULa. A lot of it is fan fiction, but they do cover genuine news in the community. You may find my old D'ni Restoration Archive to be useful. These events were replayed by volunteers in-game. I was admitted to Prologue due to the so-called Clerical Error, about a month before MOUL closed down. It was an exciting month, and I surfaced on the <Ubisoft> Uru Forums, and somehow became part of a Forum story group that had some fun in 2014. Our stories were known as "Mystery of the Bahro Caves", and "Experimental Program 1", led by intrepid Professor Thietris Squirrel, CEO, President and Managing Director, Institution of Advanced Exploration of Myst Worlds. I participated in Until Uru, mostly on the Tapestry Shard, but spent some time on other shards. I was in the Gametap MOUL, and enjoyed being part of the Beta Testing. I have been mostly lurking in MOULa, but drop in from time to time. Life has been busy, for the last five years especially. I have been a member over the years in mainly two Neighborhoods, The Institution (from the Forum story group), and The Slackers. This link http://www.brauer-crews.com/Chuckles58_TOOT.html has some webpages saved from the Mystery of Bahro Caves (not currently linked) and Experimental Program in case anybody is interested, as well as Rogue's Gallery, around the time Prologue was closing, if I'm not mistaken. Still a fan, and not going anywhere. I do miss my friends though. If you are still seeking interview targets, I was involved mostly from late Prologue (another Accounting Error member) until the end of the GameTap instance (due to burnout, unfortunately). I spent three years after that more involved with Mysterium than any form of direct Uru activity, and then finished my migration to other games. 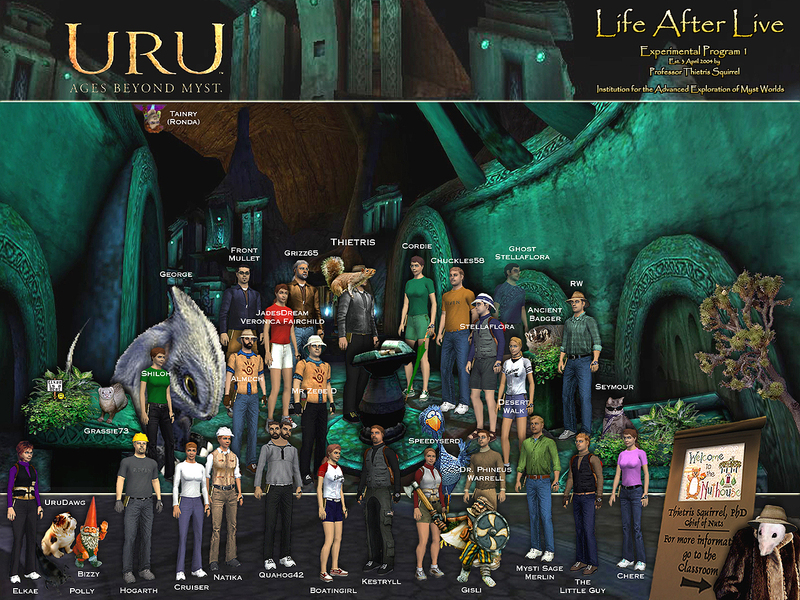 Most of my time during Interregnum I (as I called the time between Prologue and GameTap) was split between Second Life's early years and Until Uru. My primary goal within SL was to be a walking advert for the revival of Uru - which also contributed to the above mentioned burnout. Regardless, I look back on that time with fondness - even today. I'm currently on sabbatical from all online gaming, but will likely end up back on Guild Wars 2 late in the spring (because Story and Lore in abundance, oh and my copious collection of alts). In the meantime I have been enjoying an unusual collection of games, including Valley and Subnautica. The latter has been seriously triggering an Uru itch, for unknown reasons. Best way to contact me would be Discord - either through GreatOrator's server (discord.tolkiencraft.com - I'm one of his Patrons) or direct (Sungak#8269). I'm connected 24/7, but also perpetually Invis, so I'm unlikely to show up on any server activity list. It's cool to see people here with so much information available about Uru's history; I'm curious to look through some of these links. I was not part of prologue or Until Uru, but I was about some during the Gametap era. Feel free to send me a pm if you do need more interviewees, if you wish.